The OPNL New Year's Collaboration Collection features 4 all new duos! I had the opportunity to review the set that includes OPNL and LitLaq - two fantastic companies - and I couldn't be happier about it! 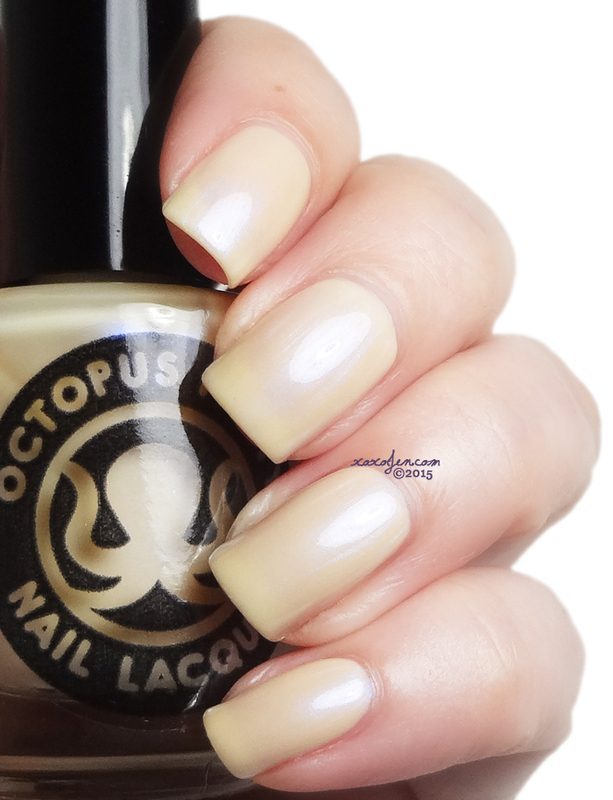 Octopus Party Milk and Honey is a yellow toned neutral with blue interference shimmer. I wore three coats with topcoat in the images below. It's an unusual color and finish for sure - I have nothing like it in my collection and don't recall seeing anything similar before. Formula was fluid and not streaky or draggy at all. 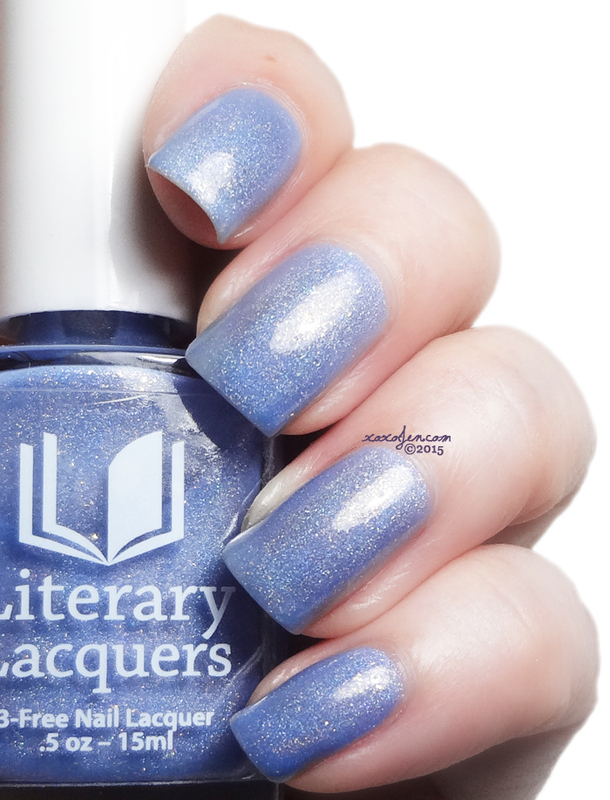 Literary Lacquers Sky of the Sky is a beautifully done holo with gold flakie shimmers throughout. This is also reminiscent of one of Pantone's colors of the year for 2016, but better. :) I wore two coats and topcoat for photos. Formula is consistently excellent as all other LitLaqs. The literary inspiration comes from a poem by E.E. Cummings called I Carry Your Heart With Me. I had not read it before, but it is definitely emotionally evocative and worth a read. I'm bookmarking it to read again and again, I just love that poem! I did up some nail art all 'fancy' like with snowflakes - these are from the Vivid Lacquer plate number VL006, a must have for any stamping enthusiast. 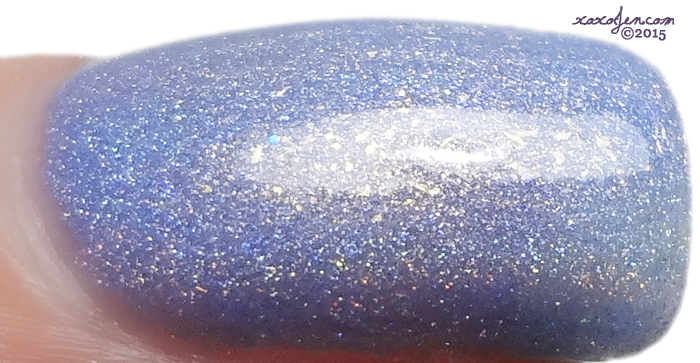 I stamped with MDU polishes over the duo. I hope you all enjoyed the review and are able to pick these up if your heart desires! I wish you all a Merry Christmas and I'll see you in the New Year!! For more awesome nail art - check the Hobby Polish Bloggers Link up! Really nice duo of colors. I in particular love your snowflake nail art. Very pretty, the colours work well to make it look snowy but also cosy! Great color combination! Pretty mani! Love the colors together, they compliment each other nicely. Snowflake manis are my favorite! !